The fine line between success and failure in sport most often lies in the intangibles and nuances of the game. 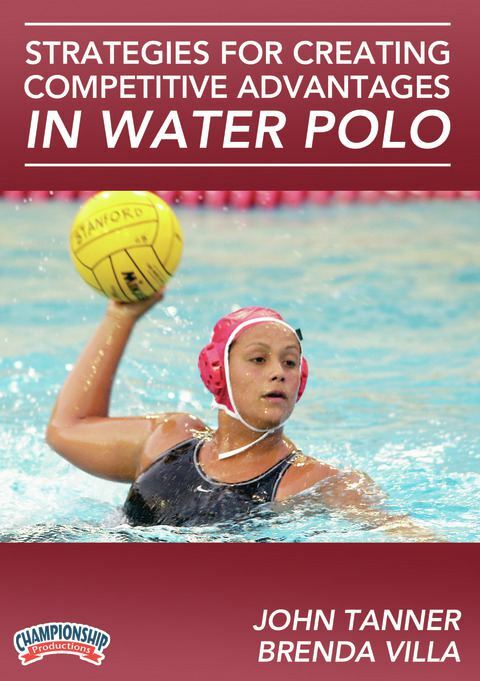 Stanford and Olympic coach John Tanner, along with 3-time Olympian Brenda Villa, detail a wide range of intangibles both in the water and out for successful water polo. Starting in the water, Coach Tanner begins with the intangible skills of defending and protecting. These skills include guarding without fouling, left-handed and right-handed steal techniques, and fake and steal techniques without impeding. Develop offensive perimeter intangibles that include turn and attack moves and drive moves to gain the advantage on a drive. Tanner provides commentary and coaching insights as Villa demonstrates how to be explosive with the legs to start the drive, including high tempo strokes and the crossover release move. Tanner reviews center vs. defender skills focusing on strong side turn and weak side drop step. This segment highlights the techniques and nuances of the leg and body positions that are most advantageous to successful passing and shooting. Core strength is also discussed as an essential skill for both passing and shooting. Moving out of the water, Tanner provides insight into managing practice giving you tips and strategies to get maximum work in minimum spaces. This segment also includes strategies for how to divide the pool and pool deck for effective mass participation and effectiveness. You'll also learn how to utilize your leaders in a way that assists in practice management. Learn how to turn perceived disadvantages into advantages in a variety of common game match-up situations. Both Tanner and Villa feel that finding balance in match preparation is imperative. Understanding your strengths and playing with your strengths while knowing your opponent in their mind offers the best chance for success. Out of the water intangibles that are presented include the importance of commitment; to the sport, to academics, and to your team that all combine to pay lifelong dividends. In a final segment, Injuries and Illness, coping strategies are discussed. This unique DVD offers invaluable across the board information into the sport that every player and coach a competitive edge over their opponents.